Considering pending UFA winger Ales Hemsky was one of the biggest names being thrown around in trade rumors, the news of his re-signing caught many off guard. Despite a low offensive output this season, the Edmonton Oilers feel that Hemsky is part of their big picture plan, and at 28 years old, still has many good years ahead of him. There was a lot of chatter that teams weren’t willing to give up much to acquire Hemsky because of his recent injury woes, and lack of scoring this season. The Oilers got a huge return on Dustin Penner at last year’s trade deadline, and were likely hoping for something similar to come their way for Hemsky, but it didn’t seem like there were any offers to that degree. Were the Oilers ever really close to moving him? Had they planned to re-sign him all along? Perhaps we’ll never know, but all we do know that is that Hemsky is an Oiler for at least the next two seasons, paying him $5 million dollars in each of those years. There was also some chatter that it could be a sign and trade sort of scenario, especially considering there isn’t a no movement clause in the contract, but 5 million is a steep price for a player with just 5 goals all season long. Did the Oilers overpay? In their minds, an offensive talent like Hemsky isn’t easy to come by, and he likes playing in Edmonton. 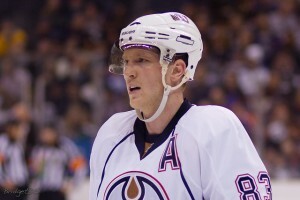 The team wants players who want to be there, and all along Hemsky never expressed a desire to go elsewhere. The contract is an interesting one, mainly because it represents the Oilers hanging on to an asset rather than selling as they had in seasons past. Oilers GM Steve Tambellini had this to say on Hemsky staying an Oiler: “For him to give that up (unrestricted free agency) at this point is big. Ales is a proud hockey player. He wants to be the guy. You want people that demand the ice time and try to be great. Ales can see the level of skill that’s coming. The type of play we’ve seen lately with him and Hall is exciting.” – Edmonton Oilers. The other future UFA on the Oilers roster is veteran Ryan Smyth. Tambellini has stated that the contract offer is on the table. The new contracts show that the trade deadline might not be a selling frenzy in Edmonton like some had thought. “(The Hemsky signing) was probably the main focus up until an hour ago. It changes the direction of what we could be looking at (Monday).” – Steve Tambellini (Edmonton Oilers).